I can't remember when or how I first landed at Leslie's blog, (the Good Report), but I liked her style immediately. And I was super impressed by her film photography skills - A.mazing. 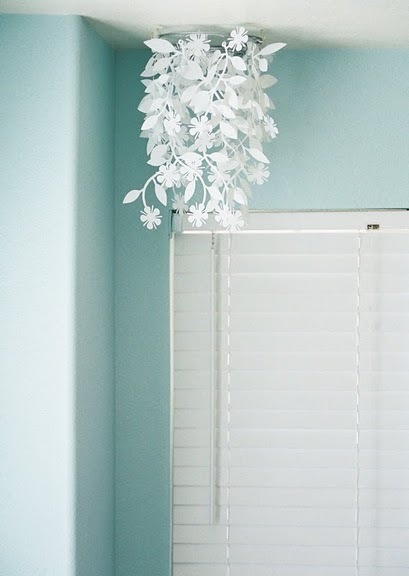 We're so happy to have her here at Bloom today, sharing some peeks into the lovely corners of her home. Thanks for opening your doors to us, Leslie. 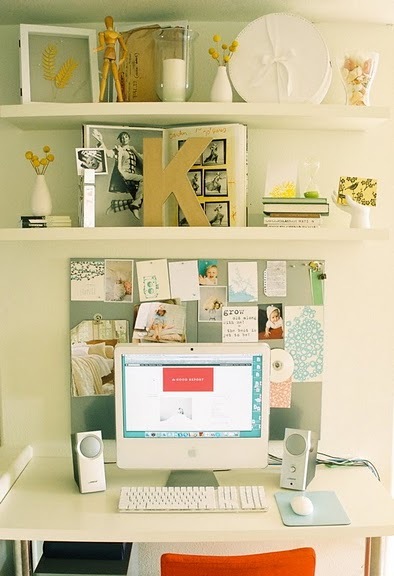 * where do you like to draw inspiration for your home? (magazines, fave design blogs, nature, etc)? I definitely get inspired by blogs. The Decorista is a current fave. and those Design Sponge sneak peeks are the best. 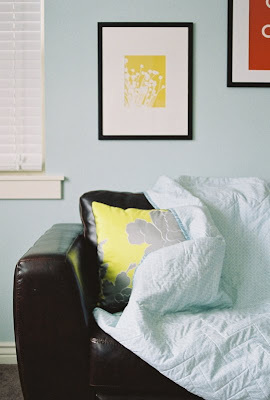 I think I'm most inspired by stylish homes done by real people (without hiring professional help). Makes me feel like a great space is attainable.... I can have the home I love too! I'm also inspired by magazines. I get way too many each month, but I just can't get enough of them. I like Living Etc, Country Living, Better Homes & Gardens, and the West Elm catalog is my dream life. Color is a real big inspiration. * your photos are so nicely arranged - what do you keep in mind when framing/displaying art? Keep it simple. I don't like ornate or elaborate frames. 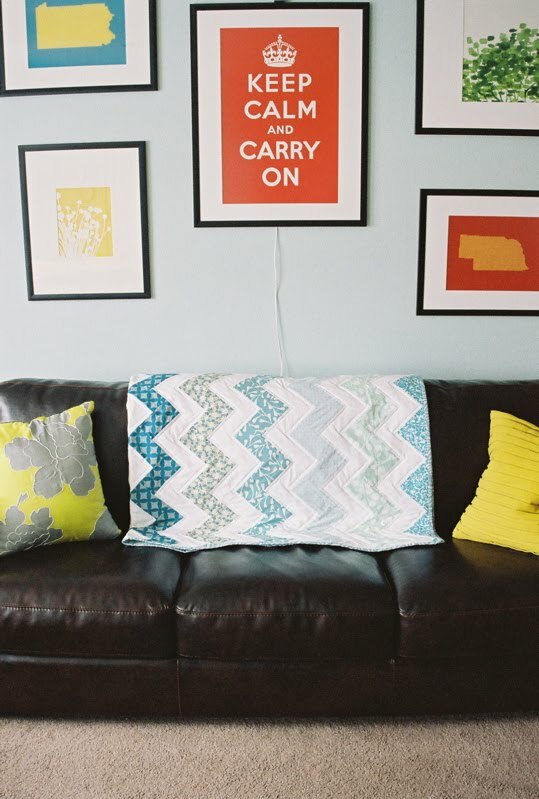 * love the prints on your wall above your couch - where do you like to look for art? Etsy is always a hit for inexpensive art. Lately, I've been looking to my own photographs for art to hang. I've been wanting things to be very personal and have more meaning to us. Which means I'm editing what is already hanging. 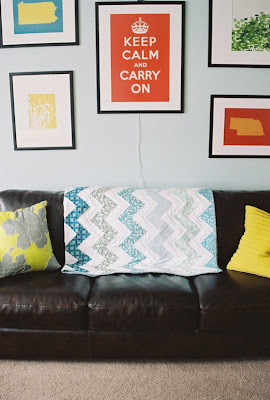 The two states you see above the couch are a little project I took on. It was totally copied from something I saw in Cookie magazine. They are needlepoints and took a year+ to finish. It was a total nightmare, but I had to finish them once I started. They'll be staying. For some reason we still claim our childhood states as home even though we haven't lived there for years. how/where do you look for good deals? any little secrets to your frugal design? I'm a huge fan of online shopping. There are so many good deals. I would love to physically browse my favorite stores and immerse myself in all the pretty, but it's just not realistic with kids. And with all the free shipping offers and discount codes online is ideal for me. The key is to not be in a hurry. Everything goes on sale. Also, end of season sales are fantastic. * i love the plates in your eating area and they're so nicely arranged - did you collect those over time? where did they come from? Yes, I collected them over several months once I decided that is what I wanted to do. I found the plates all over the place: Anthropologie, Target, Pier 1, and a local thrift store. I can't take credit for the arrangement. 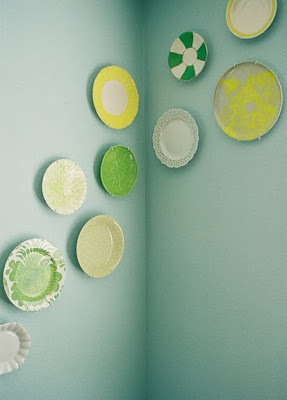 I'm sure I saw it on a blog some where, but I thought it made for a non-granny/updated looking plate wall. That mobile is a $9 clearance from Urban Outfitters. Picked it up in the store a couple of years ago and finally found a place for it. It hangs to the left of our couch. * are those just paper butterflies on the wall in the girls room? did you make them? 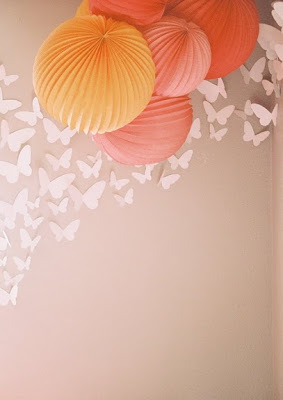 what about the pink & orange paper lanterns? and are those some of the girls clothes hanging on the wall? i think that's a sweet and sentimental touch. The butterflies are cut from white card stock. I used Martha Stewart template. I just reduced and enlarged several different sizes and cut them by hand. They are stuck to the wall with blue tack (or poster tack). The pink and orange lanterns are from the Martha Stewart wedding line for Walmart from a few years ago. The clothes are a mix of things. 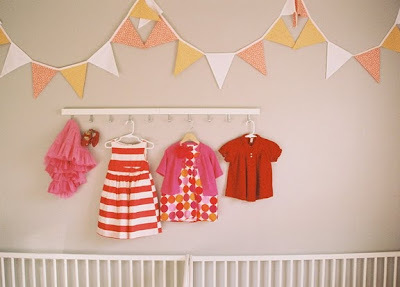 The stripe dress was purchased from babyGap. I made the polka dot dress. And the red dress was mine when I was a baby. The girls' room used to be red and grey, but I didn't like it so I pulled out these two dresses and the inspiration went from there. 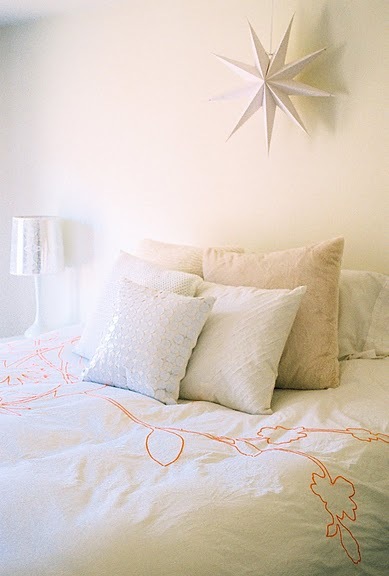 It's so much better with this decor, and color scheme. * how would you describe your style? 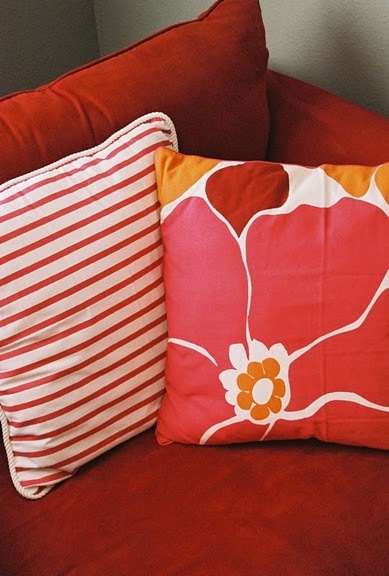 what are you typically looking for when you're furnishing/accessorizing your home? how is your space a reflection of you, your family, your life? I would describe my style as happy modern. 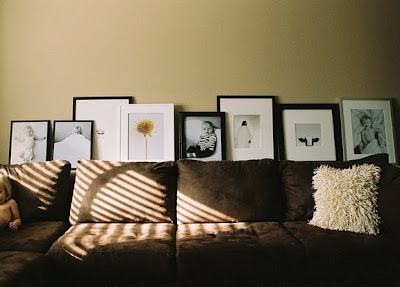 I like clean lines and simple decor, but when I started really focusing on decorating our home all that simplicity got a little institutional and sterile feeling for me. So the "happy" was achieved with pops of color. I look for things I want to stare at all day. Or more specifically that I won't get bored staring at ALL DAY. Things that will make me happy while I'm cleaning, cooking, nurturing, changing diapers. Our home is so important to me. It's the backdrop for our life. I like having something pleasing to look at while I'm living it. And so much of that is tied to color for me. I'm not really sure if this space is a reflection of us. Gosh, I think so, but we're not totally there yet. It's such a work in progress. Some of the spaces have already changed since I took those photos. I'm trying to creative a cheerful, loving, modern, interesting, meaningful little haven. Hopefully, we are cheerful and loving too. Thanks a million for the photos & the shared thoughts, Leslie. You've created a lovely space. Don't be a stranger. Wow. I am in love with her house! Such a great sense of style and eye for color.....I may have to steal an idea or two for my own place. LOVE the butterflies!